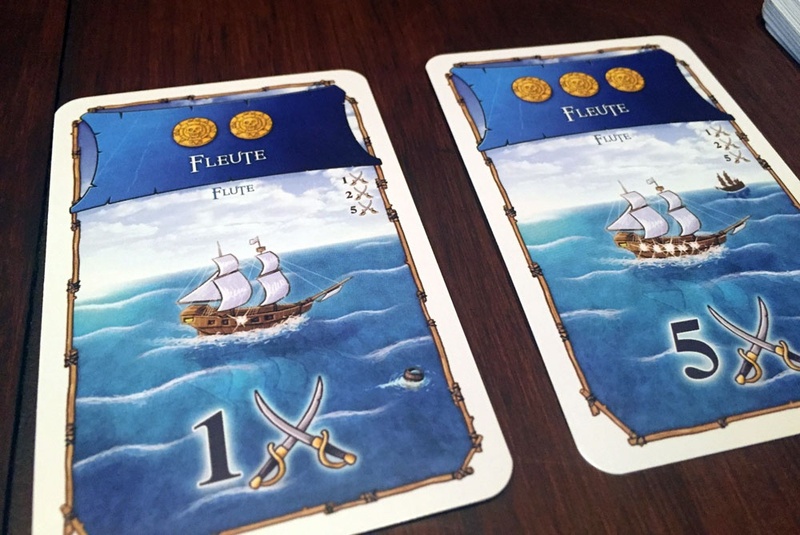 We review the easy to learn card game Port Royal. With some solid mechanics and good player interaction, this press-your-luck card game has us going back for more quite often. Head on over to the south side of Jamaica on the Caribbean Sea and you will find the town of Port Royal. Founded in 1518, Port Royal was the center of shipping commerce during the later half of the 17th century (thank you wikipedia). I could go on about Port Royal’s history, but I’m guessing you don’t really care. You’re here because you want to know about the new card game of the same name. No, Port Royal is not another pirate game where you will be plundering to your heart’s content (although there are pirates). 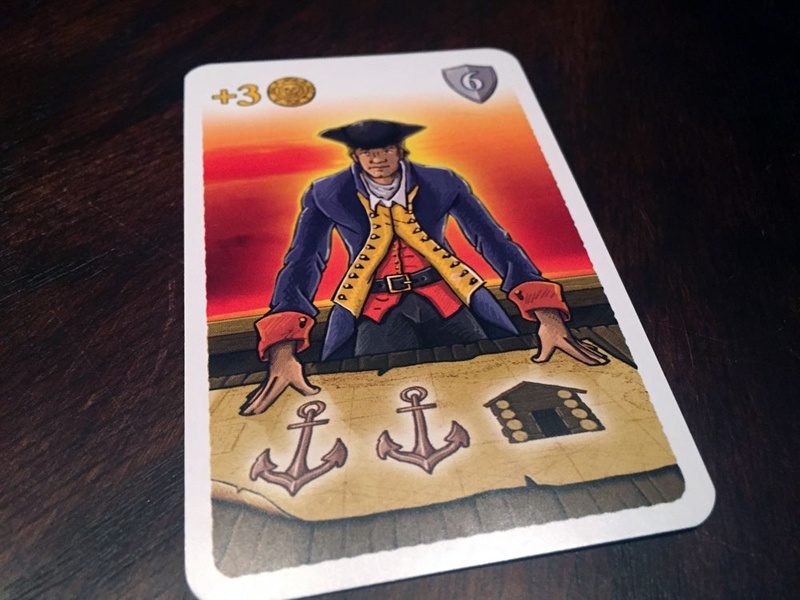 In this easy to learn card game, players will take on the role of shipping magnates, pushing their luck to earn income and hire the best people. 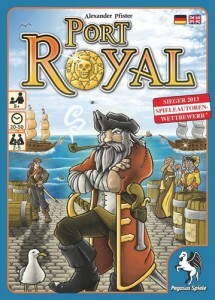 Port Royal seems to have flown under the radar since its release. Does it deserve more attention? Let’s find out! Port Royal is a push your luck, economic card game for 2-5 players that takes about 20-30 minutes to play. Port Royal plays best with 3-4 players. The goal of the game is to be the first player to reach 12 victory points. There are a few ways to do this, from hiring the right people, to going on expeditions. Each turn, the active player will draw cards from the deck until they either find a card that interests them or bust out. Once they’ve decided to stop drawing, they may purchase (or collect income from) one of the cards they drew. They must be careful however, for their opponents may buy cards that were passed over. A little bit of set collect, a dash of engine building, and some press-your-luck. That’s Port Royal. There are a 11 different types of people cards you can recruit that will help shape your strategy during the game. 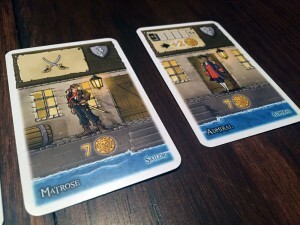 Port Royal comes with 120 cards of about 4 different types. Half of the deck is composed of people cards, which provide both victory points and a special ability. There are 11 different people in all to purchase with a wide variety of in-game effects. In addition to people, there are 50 ship cards in 5 different colors. These are the main way players will earn income during the game and also where the press-your-luck element comes into play (more on that later). Finally there are 6 expedition cards and 4 tax cards. Overall the artwork is fairly thematic and well done, but nothing that really excites me. The card quality also feels good and should hold up well to repeated plays. One thing they got right was the size of the box. It’s almost perfectly sized to fit the cards without a lot of wasted space. It drives me nuts when publishers send out a game in a ridiculously over-sized box (I’m looking at you Splendor). Port Royal is a really quick game to get into. Setting up the game should take you all of 30 seconds with about another 2-3 minutes for rules explanations. Setup: Shuffle all the cards, give each player 3 of them face down. I say face down because the back of every card shows a coin and that’s how players track their money. The game takes place over a series of rounds, with each player taking their turns in a clockwise manner. If you draw a second ship of the same color, you bust out and your turn is over. Discover: Draw cards from the draw deck and place them face up in the display. You may choose to stop drawing at any time. If you do, move on to phase 2. As noted above, there are 4 types of cards you can draw. If you draw a person card, it gets added to the display. If you draw a tax card, apply the effects and discard it. An expedition card gets set off to the side, waiting to be fulfilled. Ship cards, however, work a little different. There are 5 different ship colors and 10 cards of each color. If you draw 1 ship card, it goes into your display (unless you can repel it with a sailor card you’ve previously bought). If you draw a second ship of the SAME color, you bust out and your turn is over (skip phase 2). However, if you are lucky and draw ships of 4 different colors, you get to buy an extra card in phase 2. All 5 cards? 3 cards may be purchased. Phase 2: You may buy ONE card from those that you drew in phase 1. If you buy a person card, you pay its cost in coins and place it in front of you. The person is now worth victory points and also may give you a special power. If you don’t want to purchase, you can collect income from one ship card in the display. Discard the ship card and take coins equal to the value. Once you are done purchasing, each other player going clockwise may purchase (or collect income from) a card in the display. To do this, they must pay the cost of the card to the discard and must also pay you a coin for the privilege. Once all players have bought or declined, your turn is over, the rest of the cards in the display discarded and the next player takes their turn. The first player to 12 victory points wins. After you’ve chosen a card to buy, each of your opponents will get to buy a card from the left overs. It’s a little hard to decide where Port Royal falls in the spectrum of gaming. The small-sized box and the fact that the entire game is just 120 cards, makes me think it would be a filler game. But after many plays, the depth of game play and the play time really pushes it more into the light-medium weight category for me. Which isn’t a big deal, but if you are going in thinking you have a filler game, you might be a bit disappointed. Overall though, I had a lot of fun with Port Royal. The mechanics are solid, the down time is minimal, and the game flows really well. Port Royal really flew under the radar for me and I was surprised how much I liked it after my first play. 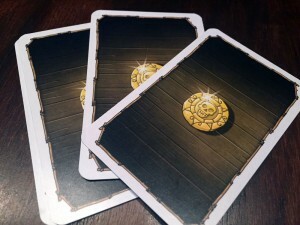 Port Royal is fairly self-contained, the back of every card has a coin on it, that’s how players keep track of money. 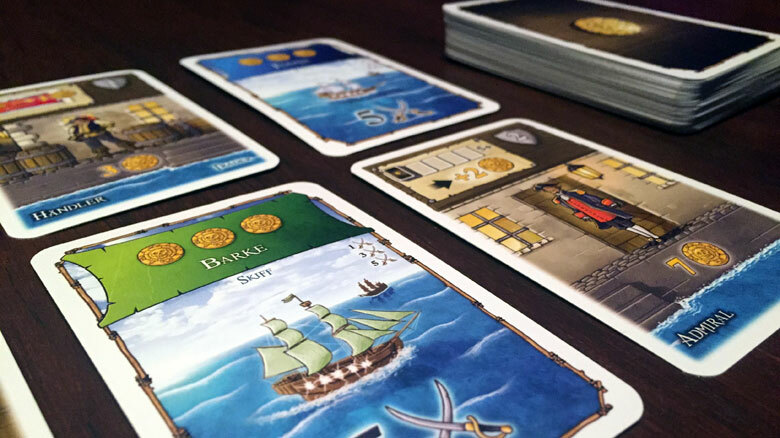 In addition to the press-your-luck mechanic when drawing ships (of which there are ways to mitigate the luck), Port Royal also features a fair bit of engine building. Each of the 11 different people can contribute to you in some way and their special abilities range pretty broad on the spectrum. The sailors can repel ships (helping you to avoid busting) while the traders gain you more money when you collect income. If you want to get into the really expensive cards, people like the governor will always let you buy two cards while the mademoiselle will give you a discount on all purchases. All this variety in the cards not only help the game’s replay value, but also give you many ways to approach the game. Sometimes I focus on gaining money and people as quickly as possible, while in other games I’ll focus on trying to complete the expeditions, which can net you some really solid victory points. 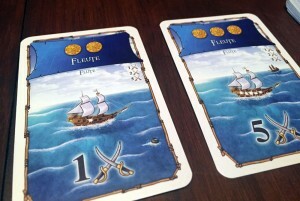 One of the nice things about Port Royal is how the card buying is done. Since other players can buy cards that you didn’t purchase, this keeps everyone involved even when it’s not their turn. In most press-your-luck games, the extent of your action when it is not your turn is usually to just root for the active player to bust. In Port Royal, I’ve actually found myself doing the opposite and hoping the active player will keep drawing so I have a better selection of cards to choose from. It’s a neat mechanic that I really enjoyed in the game. Expedition cards take a little effort to claim, but they are worth the most victory points in the game. If I had a knock against Port Royal it would probably be the late to end game. Sometimes it’s fairly obvious who is going to win as you get late in the game. The person will clearly be close to the 12 victory point line and there really isn’t a whole lot you can do to stop them. In these cases, you basically have to hope for some really lucky draws or just play it out. The only catchup mechanic in the game would be the tax cards, however those are rarely punishing. There are two ways to end the game, the first being the standard “gain 12 victory points and win”. The variant ending requires a player to have completed at least one expedition to claim victory. I find it interesting that this isn’t the main way to play as many of the cards in the deck focus on completing these expeditions. I say try them both and play the way you like best. Port Royal ended up being a pretty fun and well designed card game. It’s easy to learn rules and overall light complexity help make its way to my gaming table quite often. I enjoyed how there are many ways to approach victory and how each player can stay invested in the game even when it’s not their turn. 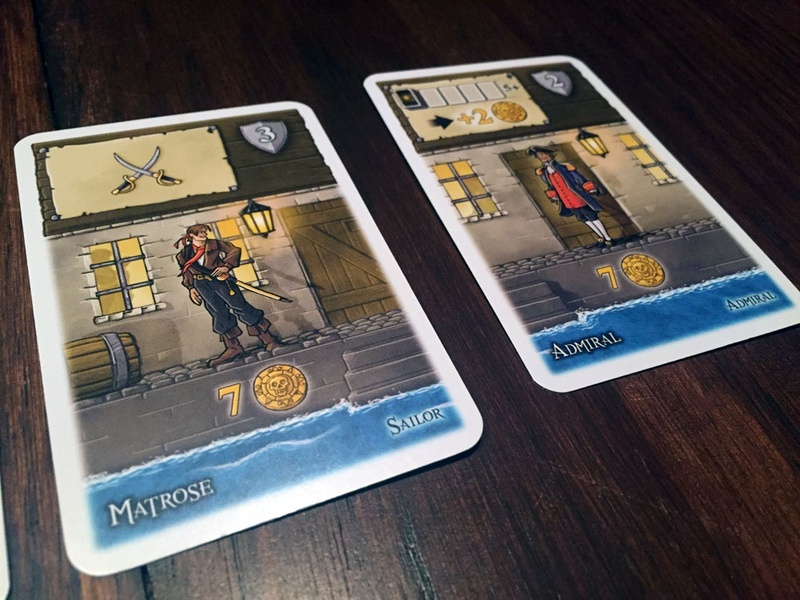 Surprisingly, Port Royal hasn’t been picked up by an English publisher yet, but the cards are in both English and German and it’s readily accessible on amazon.com. Still, I’m not quite sure why it hasn’t had a wider distribution here in the USA. I remember asking my FLGS about it and they had not even heard of it! 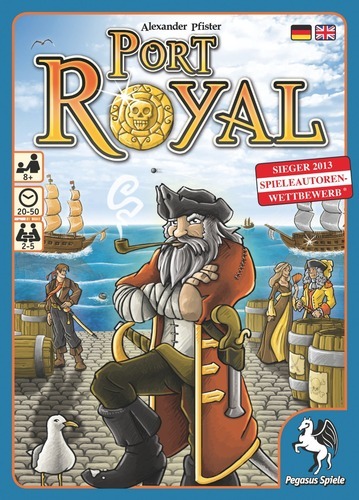 I think Port Royal will work well as both a family game and also as a filler game, on the far heavy side of the spectrum, for your gamer friends (if a 30 minute game can be considered a filler game). Give this one a look today though, it’s engaging game play and really low price point make it a win in my book. Final Score: 3.5 Stars – A fun little card game that flew under the radar for me. It’s easy to learn rules and low-cost make it an easy choice to pick up.